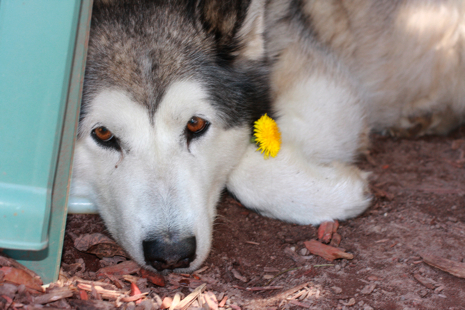 Juna, a fiesty Alaskan Malamute and former calendar model, died Saturday, June 6, 2009. She was 10. A beautiful dog with attitude, Juna died in suburban Grand Rapids after a short battle with cancer. She was diagnosed in March, but didn’t kick off until the day the neighbors who complained about her barking packed up a moving truck and went away. Some would call this justice. She loved peanut butter and jelly sandwiches, napping in the snow and quick dips in her plastic pool. She wasn’t a lap dog unless her people needed her to be and the sound of her howling along with emergency sirens was hauntingly beautiful. She got kicked out of obedience training class and dug out of the yard a couple times, but always seemed to redeem herself. Her 15 minutes of fame came when she sported a tall red and white striped hat and posed with a copy of “The Cat In The Hat” by Dr. Seuss as Miss March in a Kent District Library calendar. She is survived by her people, Jeff, Jennifer, Abby and Amelia Haywood. She was more than “just a dog” to us and the void she left in this family is gaping. We’ll miss the clicking of her nails on the wood floor, the jiggling of the tags on her collar as she moved about the house and the way she’d greet us with a tail wag at the back door. She was strong-willed and vocal, but she was our dog and we loved her – even when she barked. Rest in Peace, little Juna. We won’t forget you. You’ve an excellent blog here! would you like to create some invite posts on my weblog?